I had an inauspicious start when my flight from Nelson had a bird strike which meant we needed to return to the terminal. I missed my direct Auckland-Perth flight which meant a stop in Sydney and a later arrival than planned,but at least I arrived. 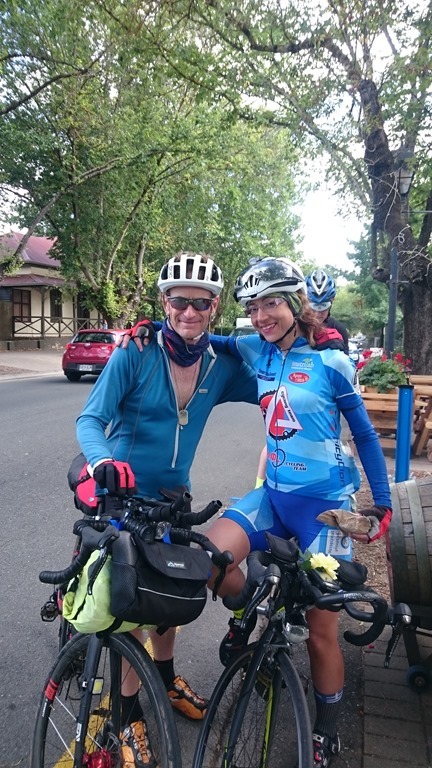 I had booked an Air BnB and was staying with the ‘Greek’ contingent: my friend Vasiliki who I met when racing the Transcontinental in Europe in 2014, and Steffan Streich who is German but lives in Greece. 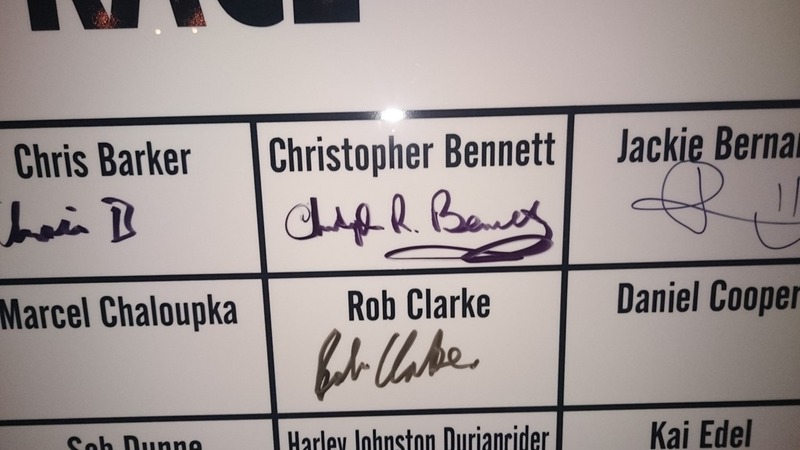 I knew Steffan by reputation—he is one of the top endurance riders around. They were at the apartment and we had a great time before the race. Both Vaseliki and Steffan were contenders to be top placers so they were taking things more seriously than me. I was aiming for a top 1/3rd finish if possible so had less pressure. Vasiliki and I rode out to the start line on Thursday to test the bikes. Good thing we did as I had a bad noise from my bottom bracket. Fortunately there was a great bike shop by the hospital (recommended by some policemen on bicycles we met—Vasiliki had never seen cycling police!) who spent some time and were able to sort it out. Thursday night we had the race party which was great. 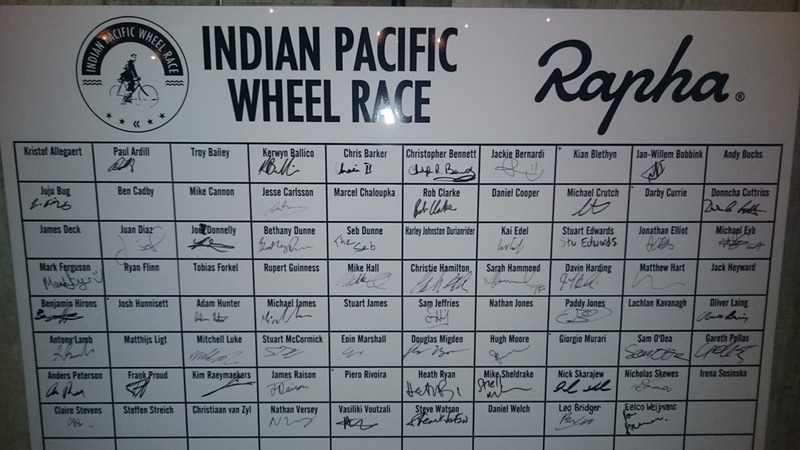 Everyone was buzzing as we signed in for the race. 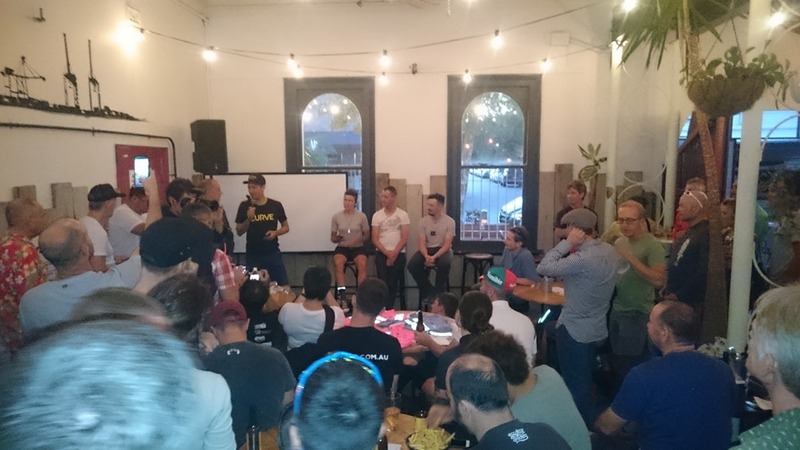 They had a speaker telling stories about ‘Oppy’, and then they interviewed the top three riders: Kristof Allegert, Mike Hall and Sarah Hammond. 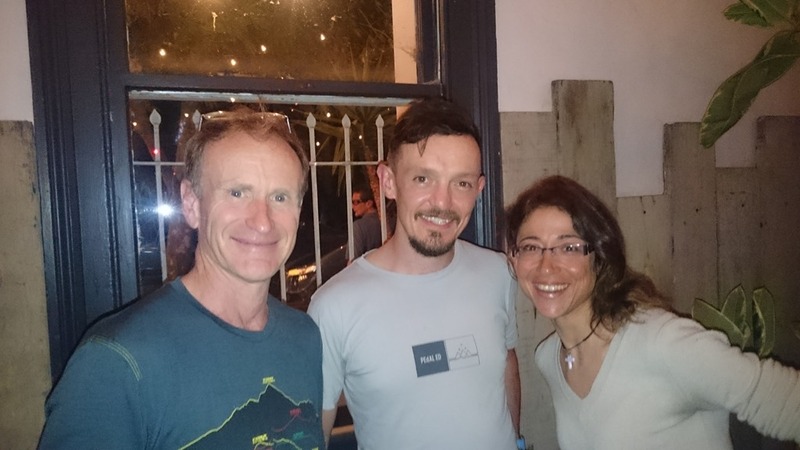 Vasiliki and I knew Mike who organized the Transcontinental race so we got the photo below with him. He was in amazing condition and clearly ready to attack this race. For posterity, here is Mike checking me in at the top of Mt. Ventoux during the 2015 Transcontinental Race (TCR). Friday morning with had a ‘reunion’ brunch of former TCR riders. There were quite a few of us racing and it was fun to catch up and relive our previous adventures. In the afternoon we went for the ‘official’ starters photos. Vasiliki, Steffan and I got our photos with the bicycle and the Indian Ocean—planning to repeat the photo at the Pacific if we could. 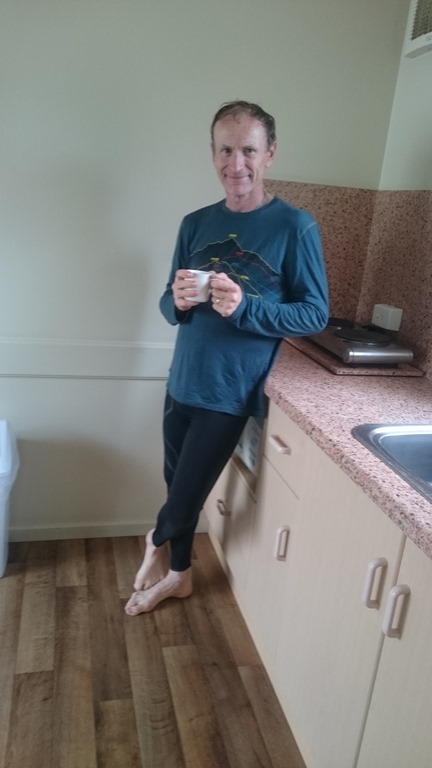 I should also add that I used my time in Freemantle to get some physiotherapy done on my left leg. I had injured my quadriceps muscle and had a lot of pain. Jesse from Freemantle Physiotherapy did a great job. Thursday was major acupuncture and deep massage and then Friday just massage and stretching. 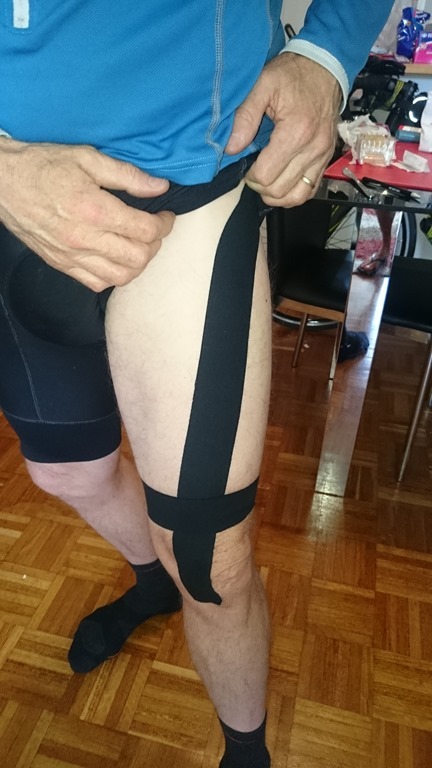 I was in a lot of pain after the treatments but with the taping that he did I would be able to ride and we were optimistic that it would work itself out. In hindsight this was probably a blessing as I did not the start the race hard, giving myself an easy first few days of about 300 km/day so as to allow my leg to heal. The race started at 06:00 on March 18—my wife Lis’ birthday. We left the apartment and rode to the start line. There were may local riders also heading over to see the start—this would prove to be the case wherever we went as the race had a lot of publicity. 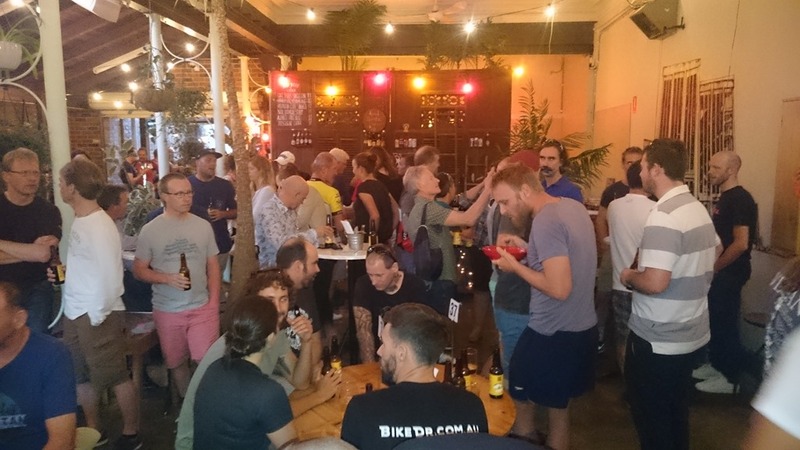 There was a light rain falling and this was a portent of what was to come … We weaved our way through the throngs of cyclists and lined up and then, we were off! Everyone went off rapidly and we zoomed through the early morning streets of Freemantle. There were a number of people out cheering us on. It didn’t take long for us to thin out and soon we were on our own, or riding with a few others of similar pace. 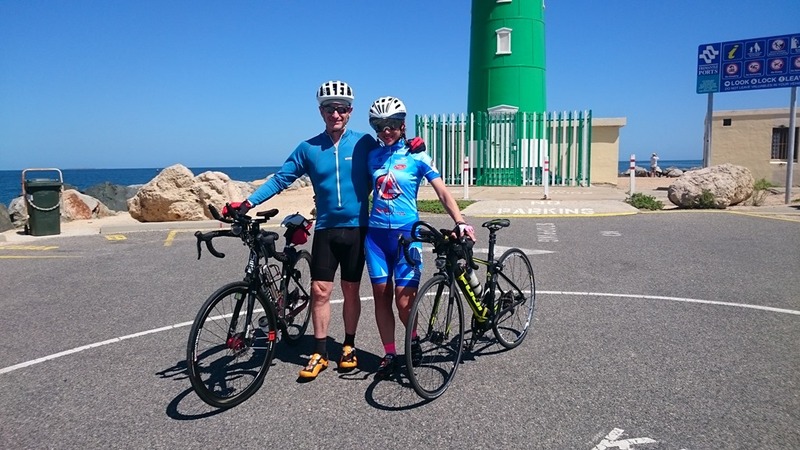 I rode a bit with Beth Dunne who I last rode with in the 2015 Kiwi Brevet, and a few others. 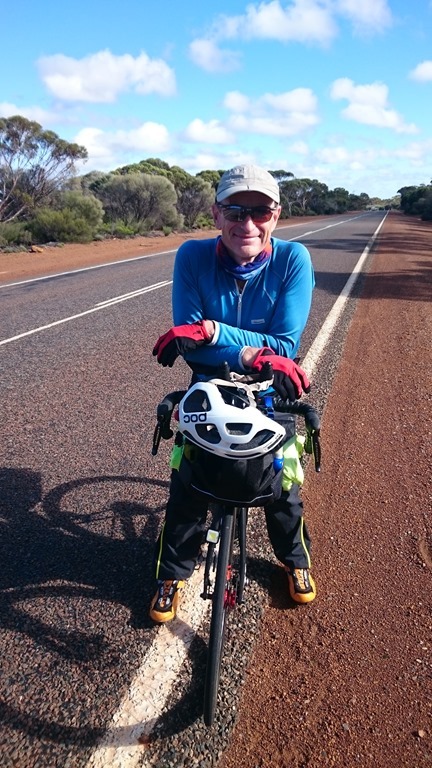 My leg was OK but when we hit the hills outside of Perth it reminded me that it was not 100% so I backed off and didn’t try anything too heroic. 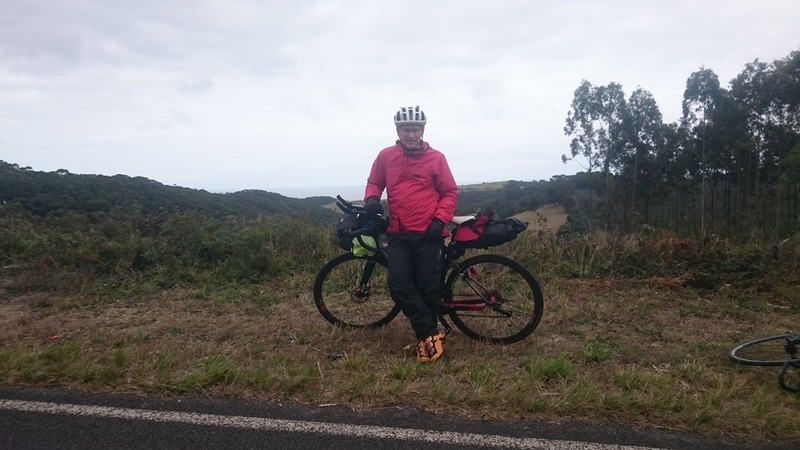 The weather was not what I expected: it rained for about 8 hours and was about 15 degrees C. I was grateful for my full rain gear but even with that one gets cold and sodden after a while. I don’t know how those travelling super light coped! The biggest hassle was the water somehow got into my Luxos light and it would only flash at a 1 Hz rate rather than be on continuously. Fortunately I had a backup, but this was really annoying and would continue for most of the ride. 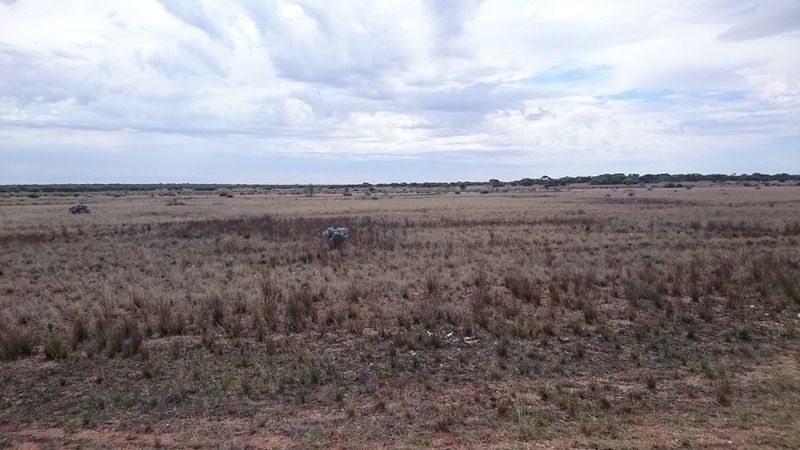 The first few days were through the western Australia farmland/wheatbelt. There were fairly regular towns and the land was fertile. 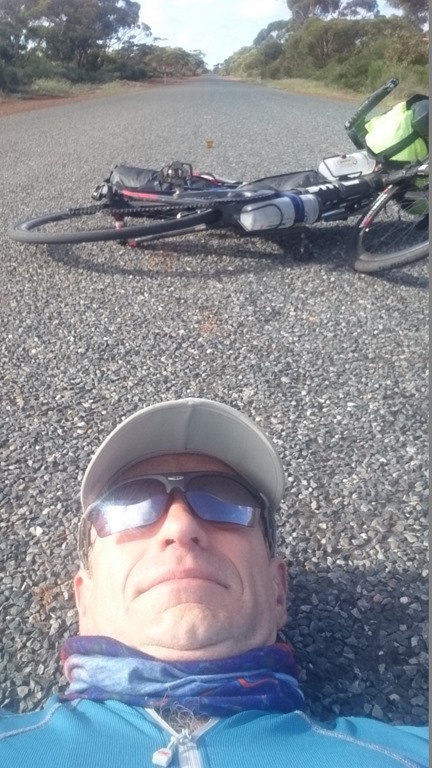 There was little traffic so I indulged in a photo lying on the road. The riding was easy and the weather pleasant. It was also easy to get regular supplies, even if some of the names of the road houses were a mouthful! 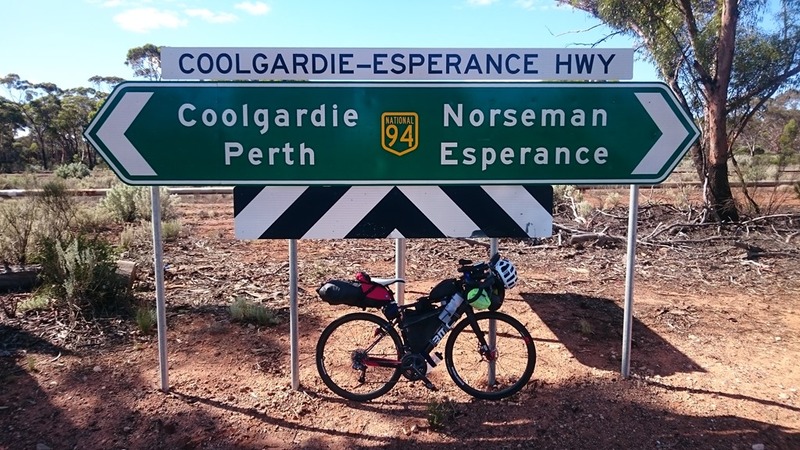 Norseman was the start of the desert and would be last supply point for 190 km. 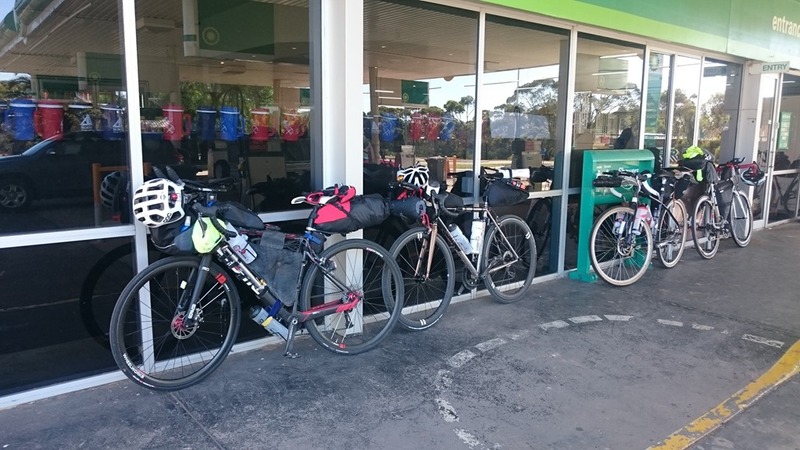 There were a few riders at the petrol station getting prepared for the ride into the desert. 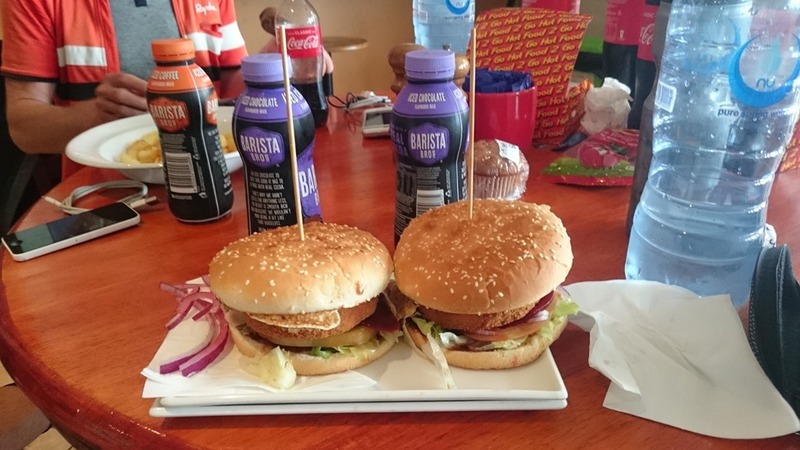 I ordered the usual race meal: dinner for two. 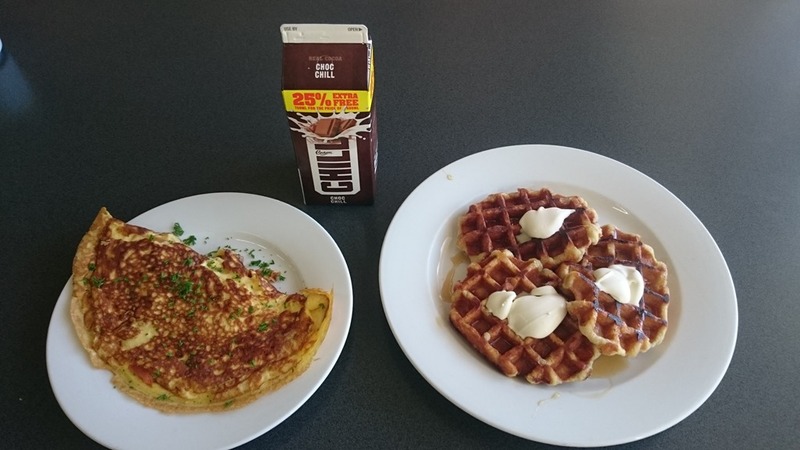 When you are burning 5000 or so calories a day it’s nice to get real food! Part 2 of the race went through the desert, where the dominant features were:(i) long distances between anywhere; (ii) headwinds; and, (iii) solitude. Typically you have about 190 km between road houses, and they are not always open 24 h. So you need to ensure that you have enough food and water to get you through the next two stages in case you arrive after one is closed. 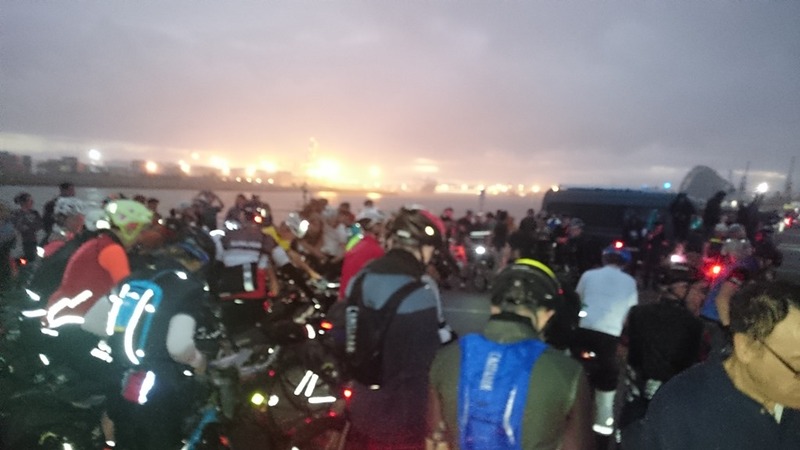 One morning I miscalculated and had to do 110 km on five biscuits and some trail mix. I had 8 litres of water carrying capacity and I used 7 of them one day. One night I camped out and it was 5 C in the morning. I was grateful for my down sleeping bag but wondered how some of the others who were travelling with only a bivy bag were faring. I don’t do cold and wet very well! 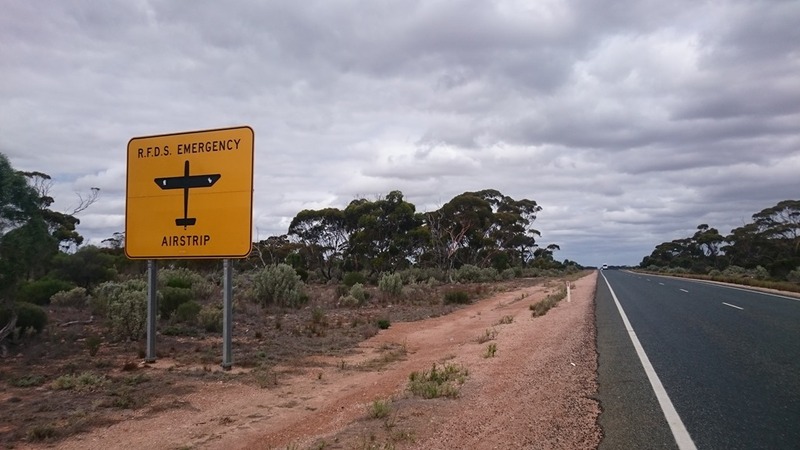 In this part of the world they use the main highway as a landing strip for emergency medical flights—seriously. They even mark the end of the strip with white lines like on many airports. 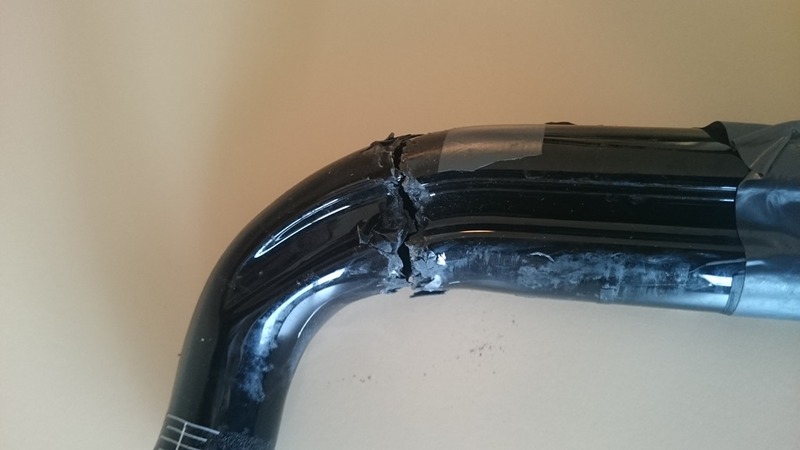 On Day 4 I had a major problem: I broke my c arbon handlebars. 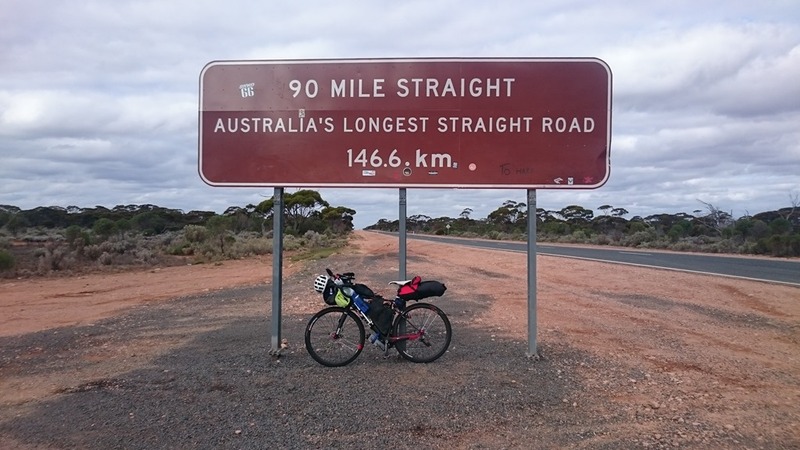 I had stopped for the mandatory photo at ‘90 Mile Straight’ when the wind blew over my bicycle. It broke the bars just at the bend along the top. It felt like all that was holding them together was the bar tape and the gel pad under the bar tape. Not good as this meant that I could not use the brake hoods as a hand position and was forced to only use the top flat part of my bar and the aero bars until I could get replacement bars. 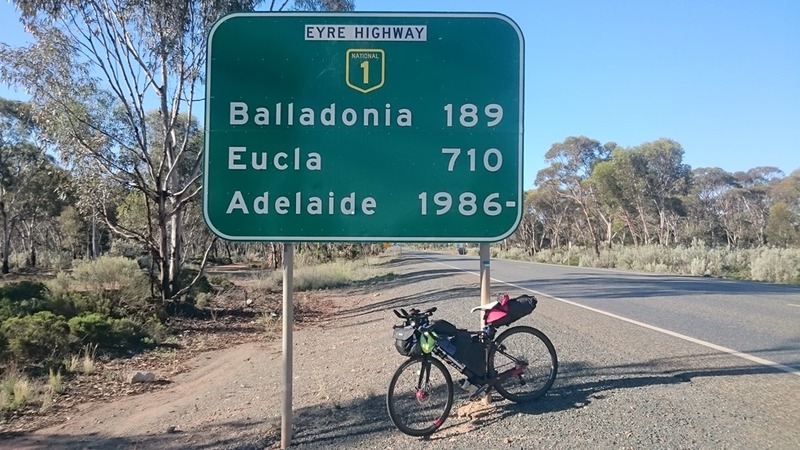 I ended up putting a velcro strap around them so that if I pushed out on them by mistake they would not snap off, but it did not augur well for me given I had about 1,700 km to the next bike shop which was in Adelaide. 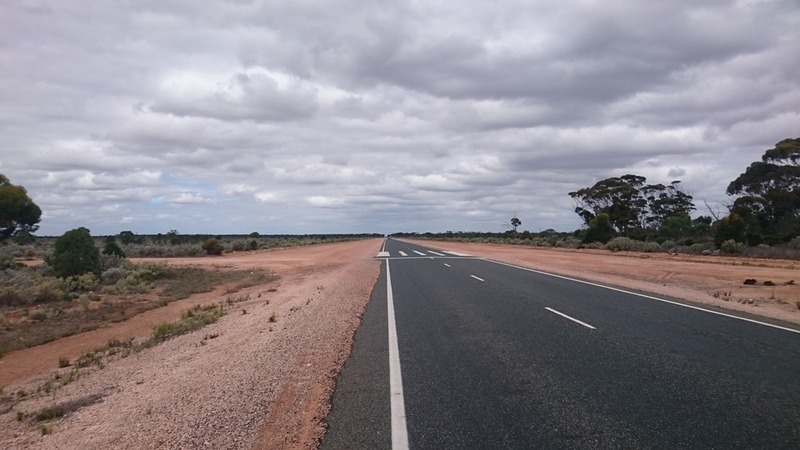 I called the bike shop and they said they could courier some bars to me in Ceduna, about 1,000 km away. After finding a motel that would accept the package I made the arrangements and headed off, making sure not to avoid the left side of my handlebars! This is part of the challenge with self-supported racing: finding a solution when something goes wrong, and one reason why I like these races! 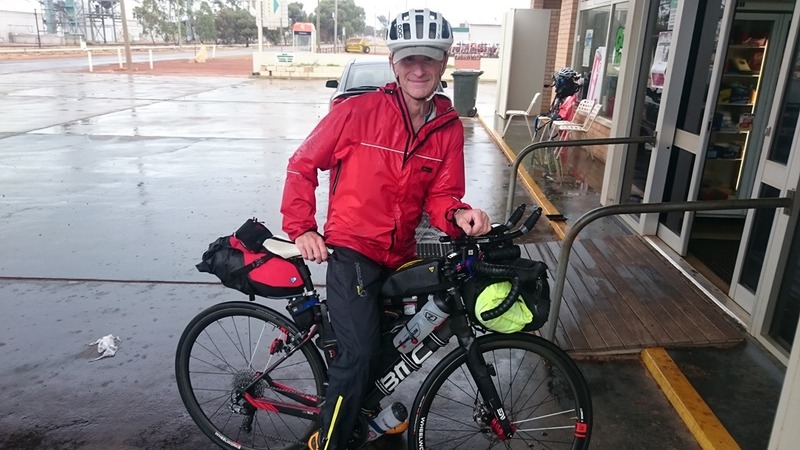 At the thriving metropolis of Cocklebiddy I met Nic Skewes who told me he was going to scratch due to saddle sores. I encouraged him to stay in the ride, sharing with him my stories of having scratched twice from the Tour Divide. 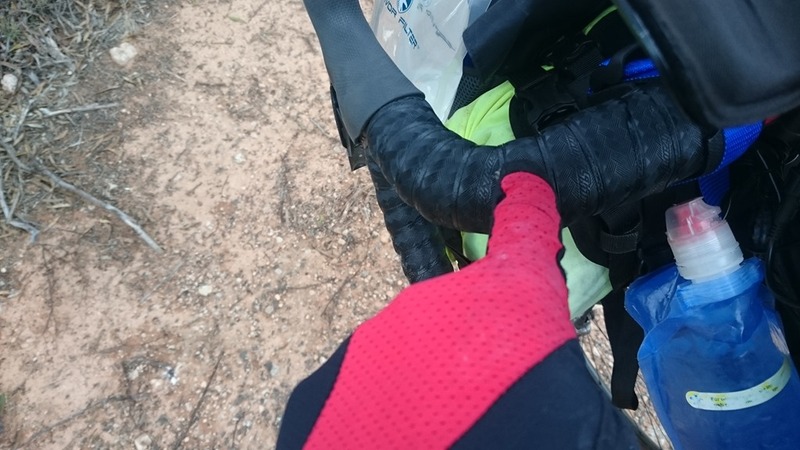 Although I should not have, I gave him one of my Re-Skin patches with the advice that he use it as they are brilliant at stopping saddle sores. 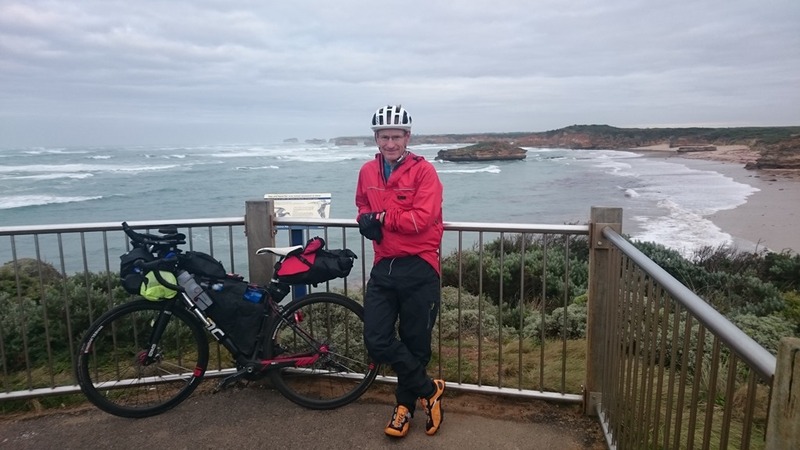 100 km later I met him over dinner at Madura and told him I had a room booked at Mundrabilla, 116 km down the road, and he should join me. We met up just before there and shared the room, and he kept on riding—eventually passing me on the last day of the ride. 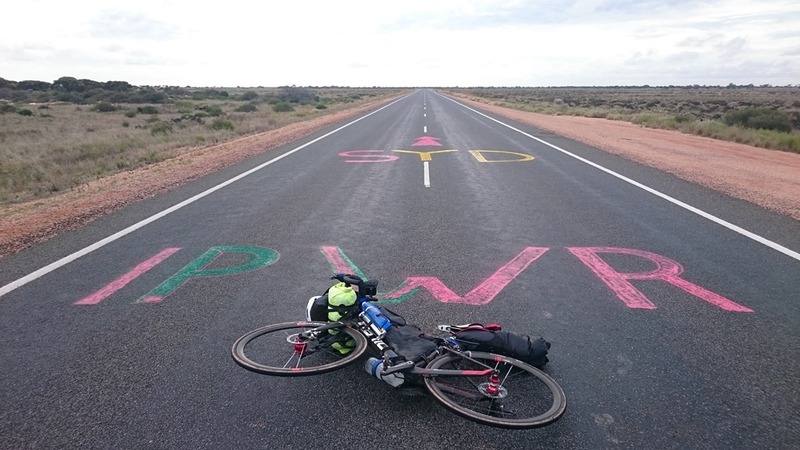 The desert riding was great, except for the crushing headwinds and the road trains rushing by. With the latter I would often move to the shoulder and dismount so as to protect myself from being blown off my bike—a real possibility if two are passing in opposite directions! I preferred cycling at night as you could see traffic coming from a long way off, and were rewarded with the most beautiful stars imaginable. 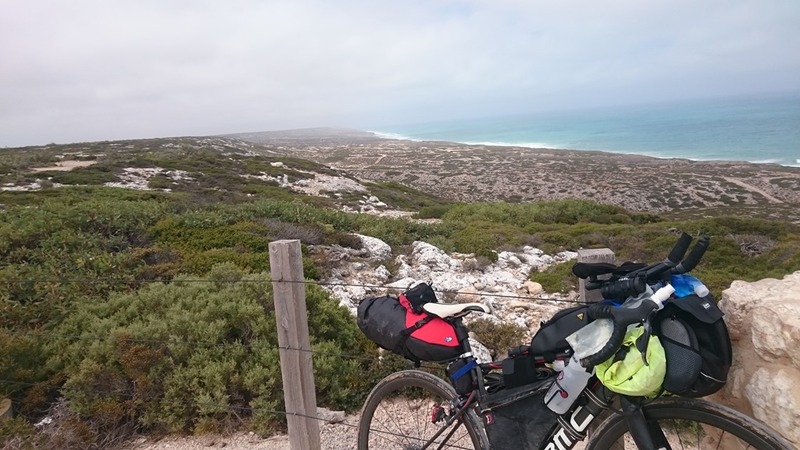 At the ‘Great Australian Bight’ which is the southern coast I met up with Toby from Germany who had scratched due to a knee problem. A nice couple were giving him a ride to where he could get back to an airport. 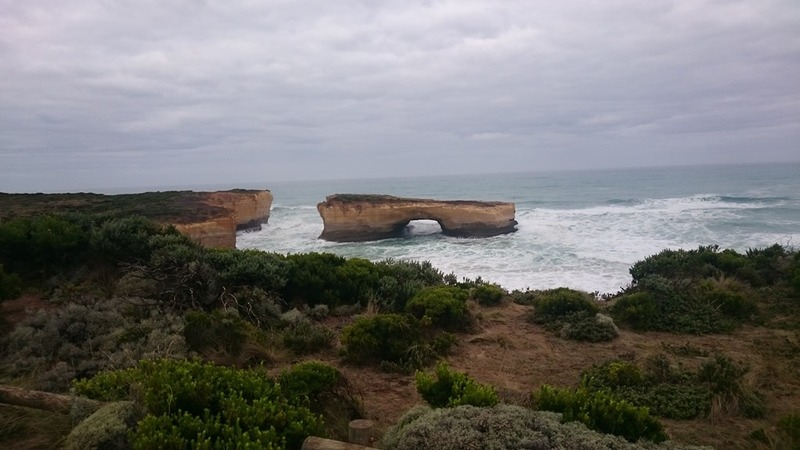 It’s a beautiful and stunning part of the world where Australia ends and there is the great southern ocean. I made several stops for photos. Probably one of the few racers to do so! 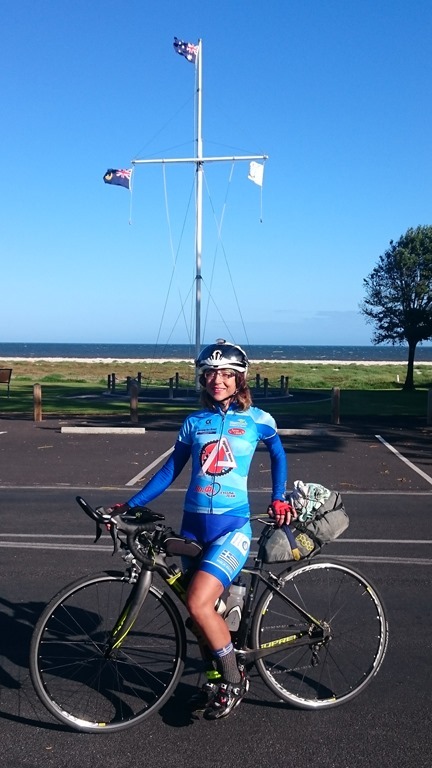 I arrived in Ceduna at 23:00 h and found the motel which had the package with my handlebars. The next morning I spent several hours working on the bike and it was a miracle that they lasted as long as they did. As I was leaving I met Ryan who had just arrived and was getting food at the petrol station. I tossed him my room key and said that he was welcome to have a sleep or shower—which he was grateful for. 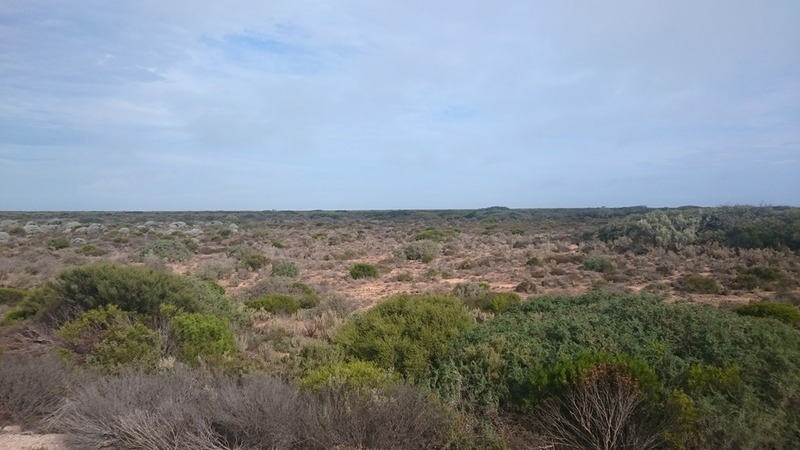 Leaving Ceduna I decided it was time to see what I was up for. I had taken it relatively easy until then, averaging just over 280 km/day. 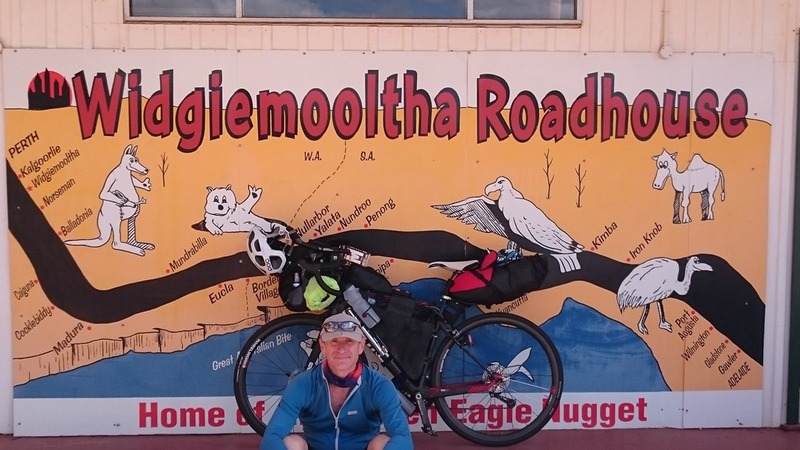 So I decided to make a run for Port Augusta or even further— about 470 km away. 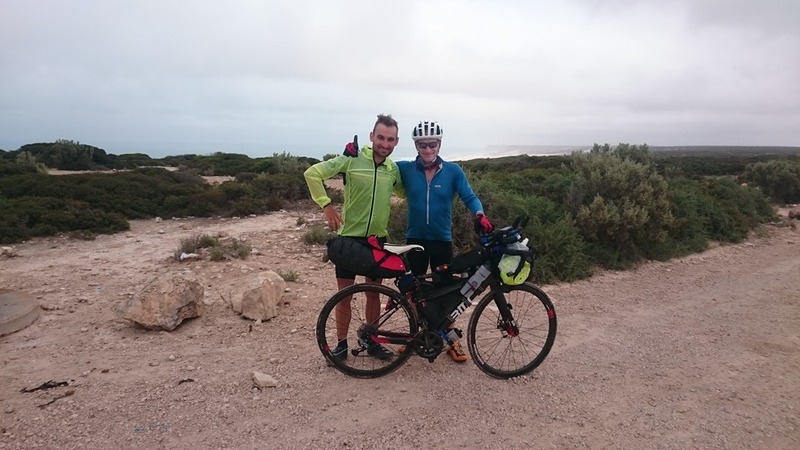 My decision was reinforced when I met up with Nic again who advised me that there was a forecast of a tailwind, and also 40+ C for the following day. So I rode through the day and when I stopped for supplies at Wudinna at 21:00 h still felt really good and was ready for an all night run. As I was heading out Nic rode up and told me after 300 km he was going to stay there for the night—later he told me he regretted it given the winds he faced the following day! I also met two fellows getting their weekend beers who asked if I was in this race with the ‘Greek Girl’. Obviously they were referring to Vasiliki. They had met her a day or so earlier and said that she was unable to hold her head up. Later, she messaged me a photo with her head off to the side. A sure sign of Shermer’s Neck which is a condition where your neck muscles give out due to riding for too long in the aero bars on your bike. 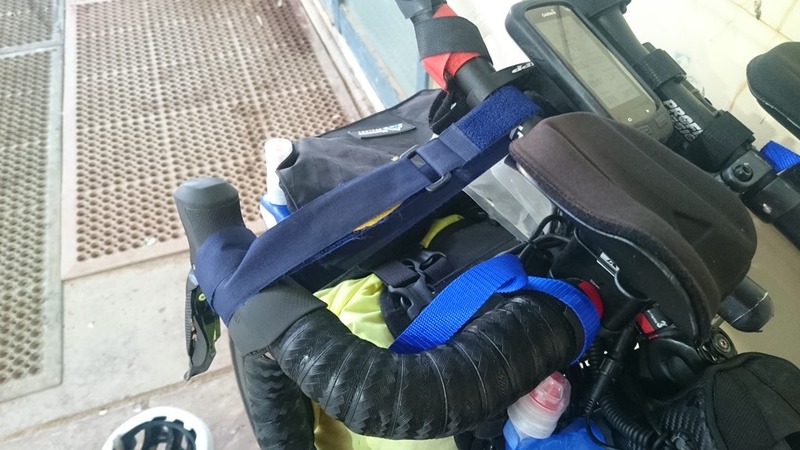 Felix Wong wrote about this after the Transamerican race and when I was using my aero bars I made sure that I exercised my neck to avoid the problem. 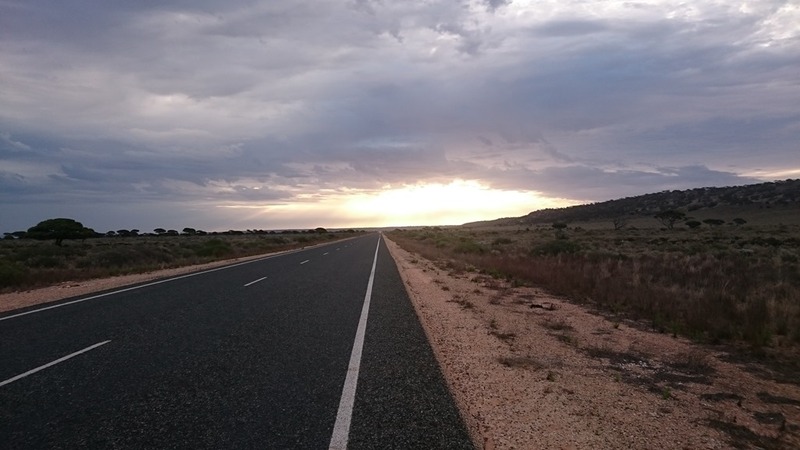 The run over night towards Port Augusta was great and I felt really good as the sun rose. However, the wind changed to a strong headwind and the heat got up which took its toll. The last 65 km were a really hard grind and took me over 4 hours. 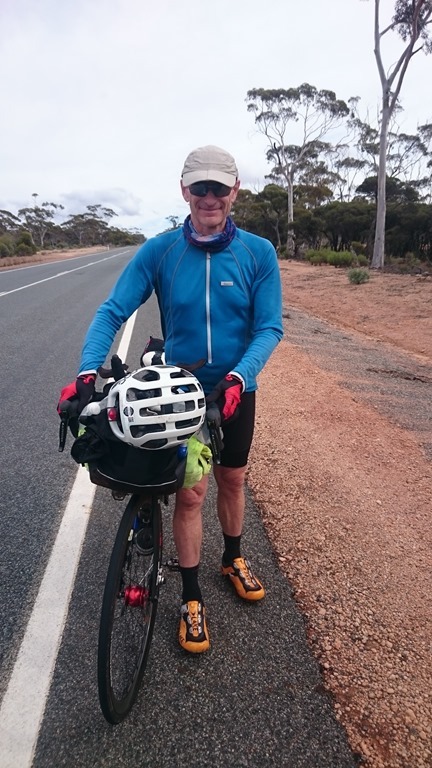 It was 43 degrees when I arrived in Port Augusta at 13:00 after 471 km and I was spent. 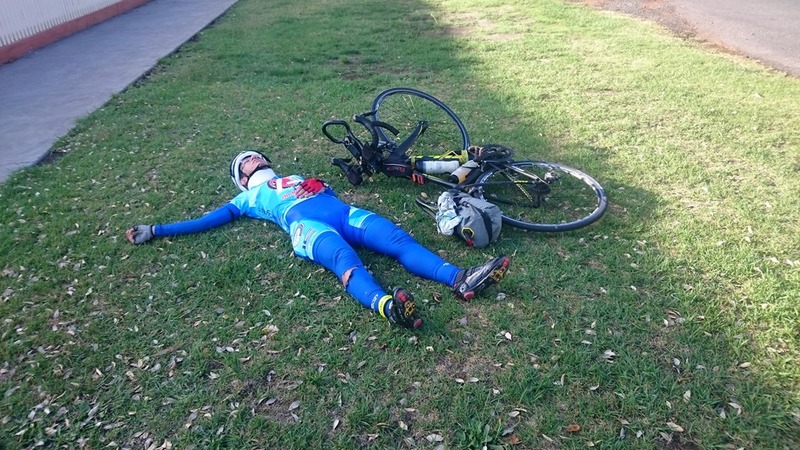 I found a bottle shop, got two bottles of ‘Poweraid’ and collapsed on the floor for a bit of recovery. After about 30 minutes I felt ready to ride again so I hopped on my bike to continue—but the rear tyre was flat! 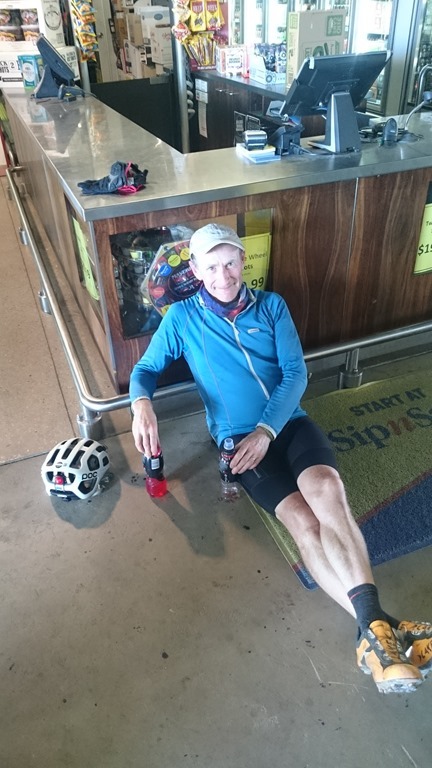 I suspect that it was due to the heat causing a break in my tubeless seal so I took the bike over to a petrol station to reseat the tubeless tyre, but their compressor was broken. After two ice creams to console myself I put in a tube. I wanted to keep on riding so headed out of town after grabbing some food, but it was baking hot and I decided that it was unwise to continue. So I grabbed a hotel room and sat under the air conditioner refuelling myself. 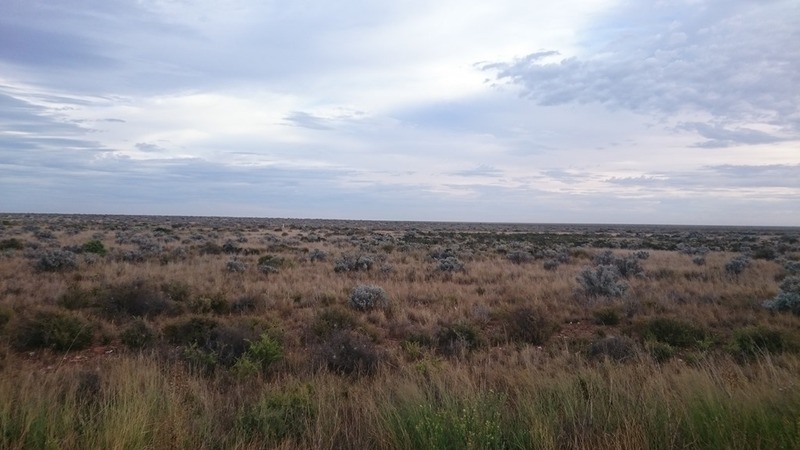 After 4 h sleep and some more food I headed out at 21:00 h for Adelaide, 360 km away. It was still very hot and about 20 km from town the route took us up some steep hills. 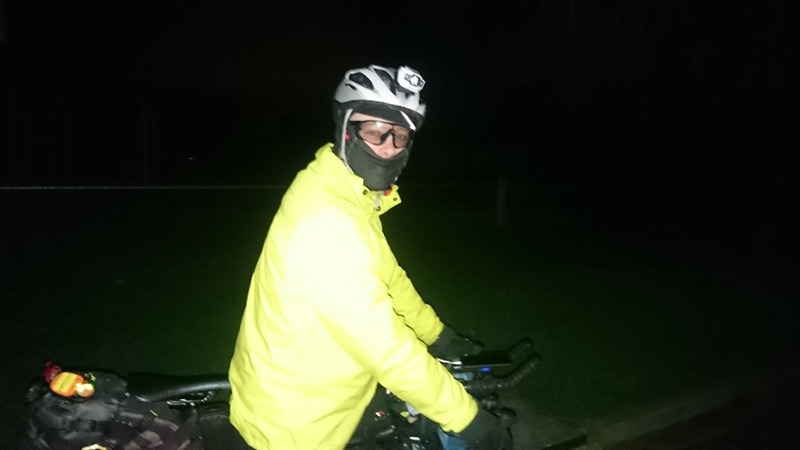 My legs had not recovered from the earlier efforts and I struggled, but eventually I reached the top and had some nice night riding over rolling terrain. I could see that a number of riders had stopped for the night ahead of me and I was optimistic of catching them by the morning. It was a great night ride but about 05:00 I got hit the by the sleep monster. I found a playground and sat on a children’s slide for a 30 minute snooze, before continuing on. 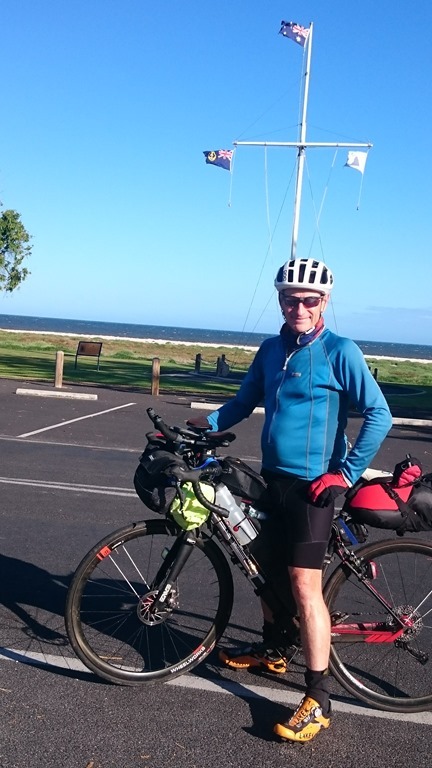 In the morning I got to Clare where I saw Frank Proud cycle by, so I knew I had caught up with the group. 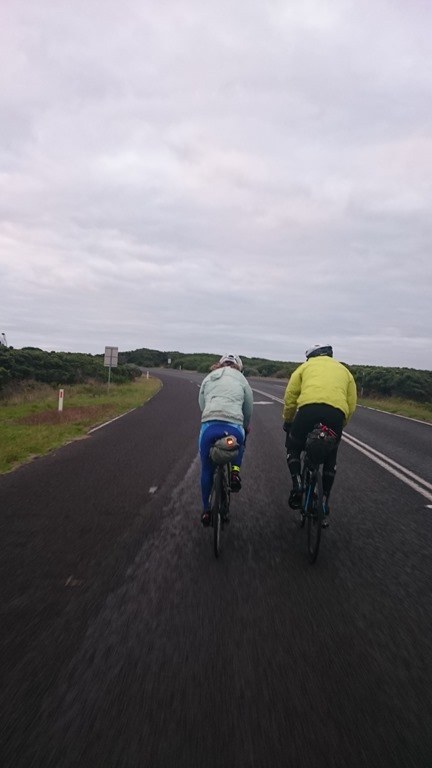 The ride took us through the rolling hills of the Barossa Valley which were lovely, although we did have some very strong headwinds (again!). I was really pleased to reach the half-way point that afternoon. 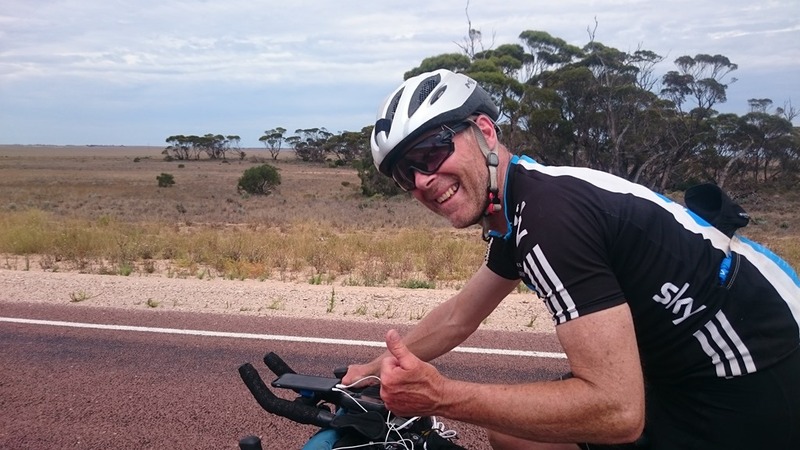 The ride into Adelaide was great as it took us along a river side cycle path. I was joined by a local rider who had ‘escorted’ a number of other riders in as well. He took me to the bike shop where I had arranged for a service to be done – tune up and replace the chain. Having done 823 km in two pushes with 4 h sleep I decided to spend the night in Adelaide before the next big push. 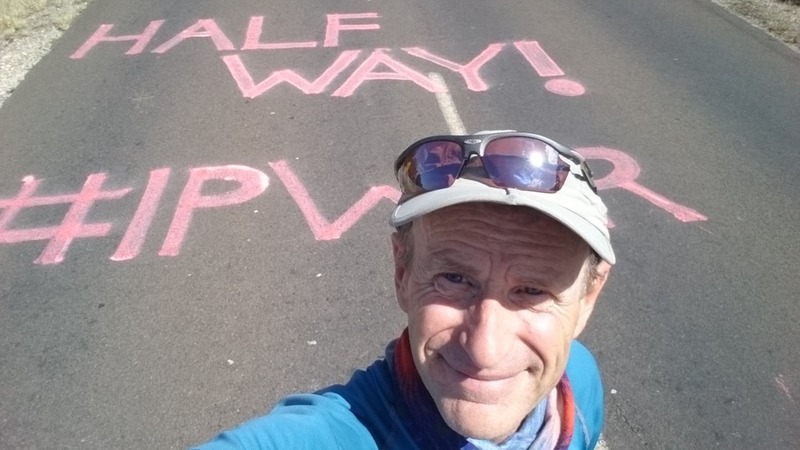 After a great dinner with my friend Annie I retired for the night … but then I got into a conversation with Jesse the race organizer about Vasiliki. It seems that Vasiliki’s neck had got worse and Jesse thought (which I agreed) that she was endangering herself by continuing. She was unable to lift her head and so was basically riding looking down at the pavement. 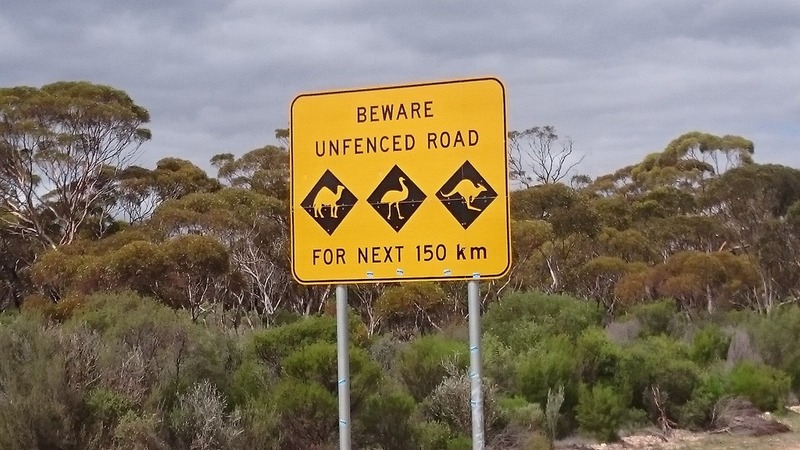 This meant that she was unable to see things coming up (like the dead kangaroo or parked car she hit), nor was she able to see what was coming from behind. Since her safety was so important we three agreed that I would ride with her and keep her safe rather than push on with my own race. To me it was not a big deal as I would rather finish knowing she (or any other rider) is safe than get a top 15 placing. While we are racing each other, we also want EVERY other rider to finish. 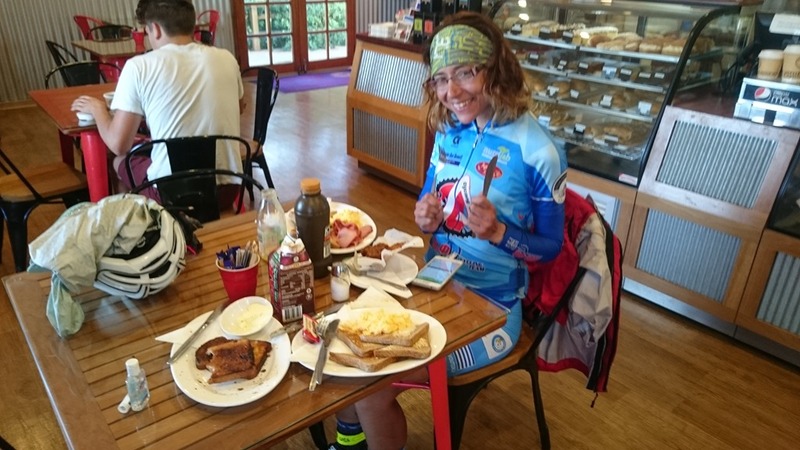 After collecting my bike in the morning I rode to Hahndorf where I met Vasiliki. The previous day she had hit a parked car and some locals took her in for the night, got a physiotherapist to look at her, and taken really good care of her. One of them was a cyclist (John) who rode out to meet me and was great company (and a strong rider!). He changed her stem to one that was smaller which would also have helped. I was really concerned about her continuing but she was adamant that she would not quit. So we developed a riding approach which consisted of me cycling about 6 bike lengths back calling out ‘Left’ ‘Shoulder’ or ‘Clear’. The first meant a vehicle was approaching but it should be able to pass safely so move over to the left. ‘Shoulder’ meant that the situation was such I wanted her on the shoulder (e.g. two opposing vehicles approaching, or a truck from behind). ‘Clear’ meant it was safe. She just rode looking down at the white lines in the centre of the road or on the left when they were there. While I got a sore neck myself looking back every 30 seconds, it was workable and we made steady distance. We even got some fans! I suggested that Vasiliki take some of the pressure off her n eck by supporting it with her hand so she adopted what I called the ‘Plato Pose’ after the Greek philosopher. This is her using it after we got her a neck brace in Rose. It worked OK except the glove gave her a massive bruise on her chin—looked like someone had hit her with a massive upper cut! I have deep respect for Vasiliki’s ability to suffer: I have no idea how she was able to ride as much as she did in such pain and discomfort. 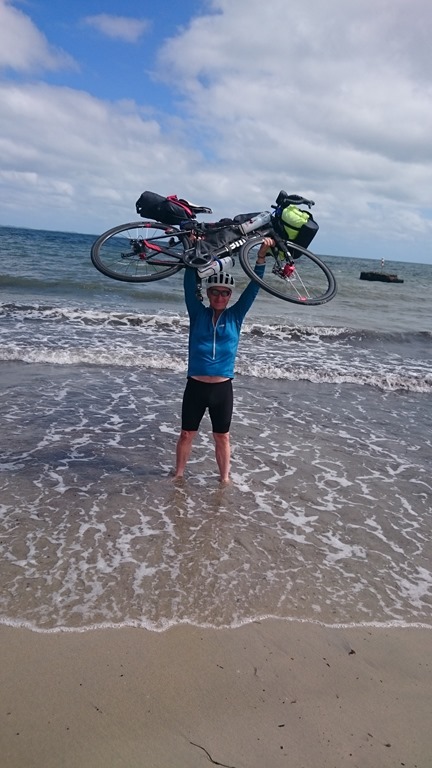 If there was a prize for grit and determination it should go to her! Although we were ‘together’ we were not as I had to ride behind her giving my three commands. Still, we enjoyed it when we reached towns and it was also nice to have someone to take my photo! One day we had great tailwinds but then got hit by one of the worst storms I have ever experienced. Got totally soaked and then the winds came from all directions—so strong that we could not make forward progress. There was nowhere to hide so we got buffeted and beat up. We managed to get near Bridgeport and found a toilet block where we took shelter, before heading to the campground where I rented a cabin and we had hot showers and dried our clothes. After it cleared we headed out to make up for lost time. 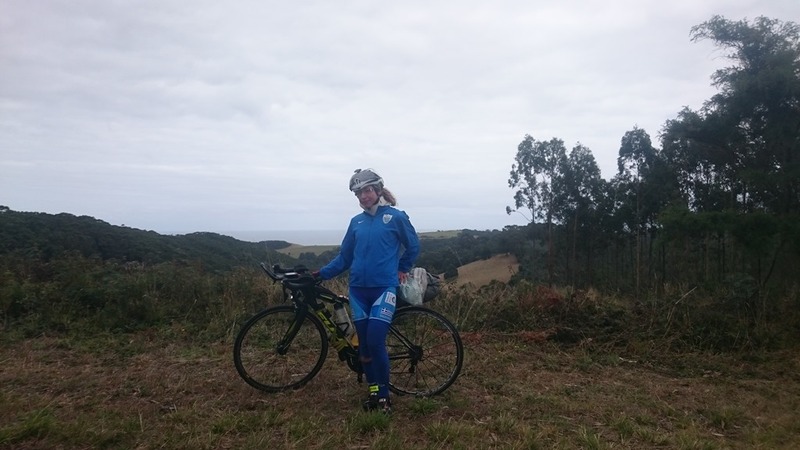 Vasiliki really struggled the next day and we only managed 179 km (compared to 308 km the day before). In Portland she lay down in the restaurant after lunch and had a sleep—even though the noise from children was off the charts. Of course I was not a lot better as I got caught taking a power nap on the main street. We celebrated reaching Yambuck and pressed on. 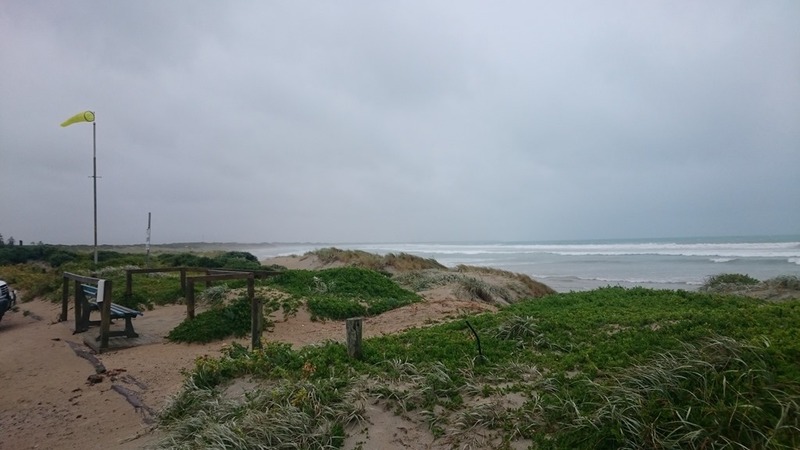 Vasiliki was done by Port Fairy. 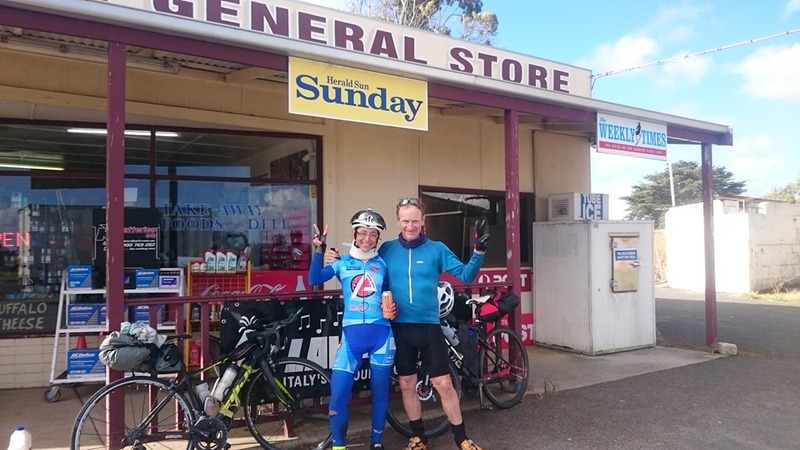 She managed to do another 26 km to Warrnambool but I told her no more so put her in a motel and went over to the supermarket where I got dinner and breakfast. Vasiliki wanted an 03:00 start but I said we would get up at 04:00, and she acknowledged the extra hour was of great value. 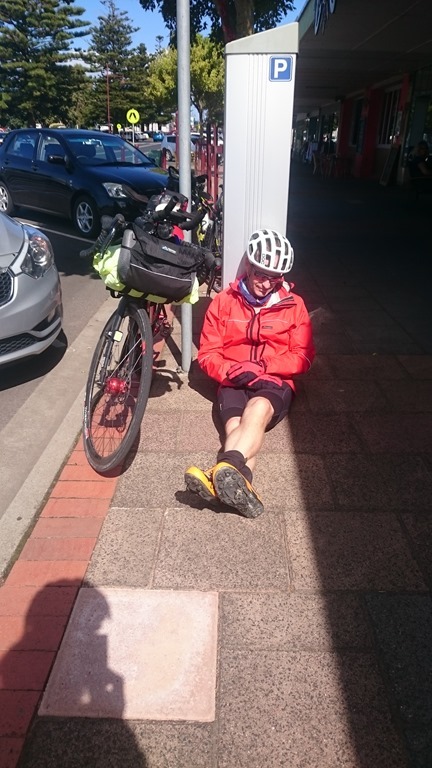 As we rode on in the early morning we passed a bus shelter and there was someone sitting there sleeping with a bike. It was Nic! He had overnighted in Port Fairy and we woke him from his power nap. It was gre at to see him riding so strongly, even though I knew he would now finish ahead of me . 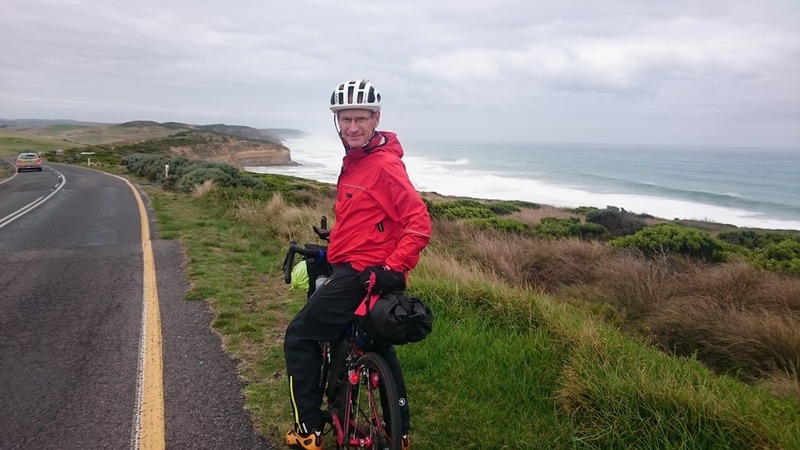 He rode with us as we cycled along the ‘Great Ocean Road’. I have to admit selfishly that it was nice to have him along as it took some of the burden of my looking out for Vasiliki off my shoulders. In spite of my best efforts there were a number of (what I thought were) near misses … and it was pretty stressful trying to ensure that she was fine. There was stunning scenery along the ride … here are some photos. Nic soon outpaced us—or me. 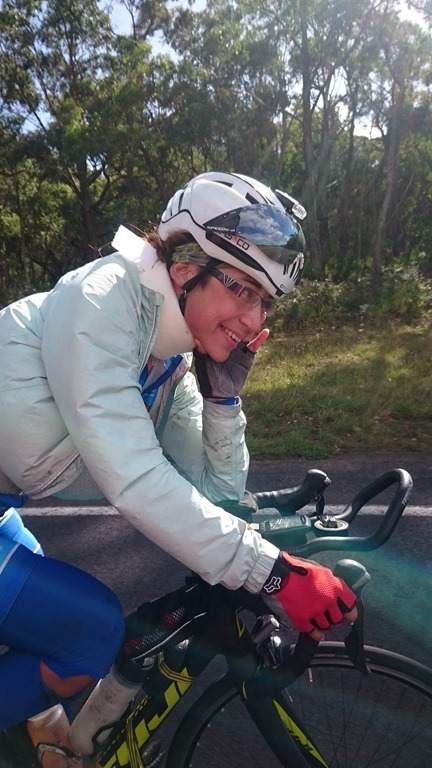 Vasiliki is such a strong rider that she would drop us both on hilly sections, even riding holding her head up. I was also stopping for a lot of photos. We stopped for lunch at a cafe and got the news that Mike Hall had been killed and that the race was cancelled immediately. This was a real shock and serious demotivator, at least for me. 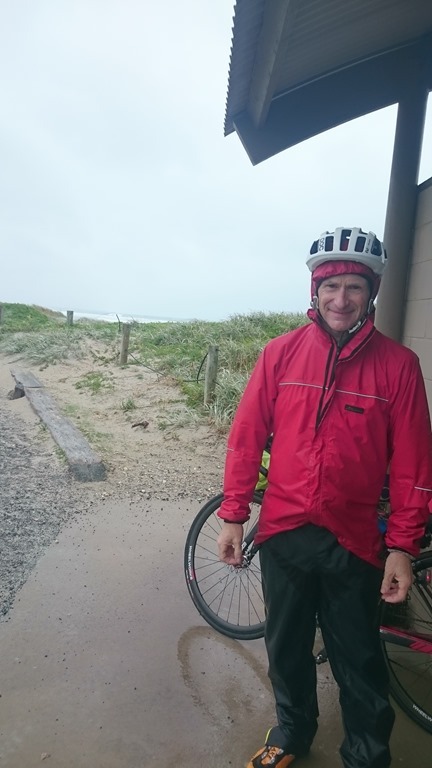 I found it difficult to continue riding given what had happened, but we had no choice but to reach Apollo Bay which was the next major town. I dropped so far back that Vasiliki stopped a few cars to see if they would give me a ride! 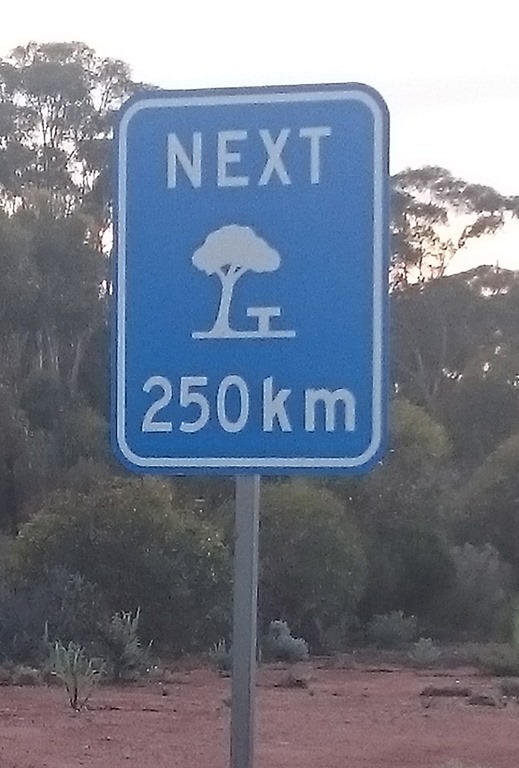 We ‘officially’ decided to stop racing at km 3645, about 40 km from Apollo Bay. We took a few photos to mark the end of our race. 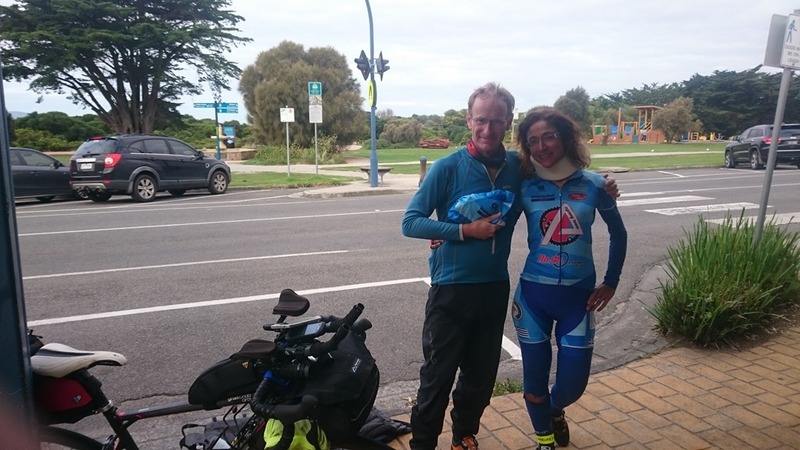 We continued on to Apollo Bay where we met Nic outside of a shop run by Bernadette—a blue dot watcher who had been following the race and greeting the riders as they passed through town. Nic’s brother Dave was coming over that evening so he kindly offered to take us to Melbourne. He got this photo of Vasiliki and I. 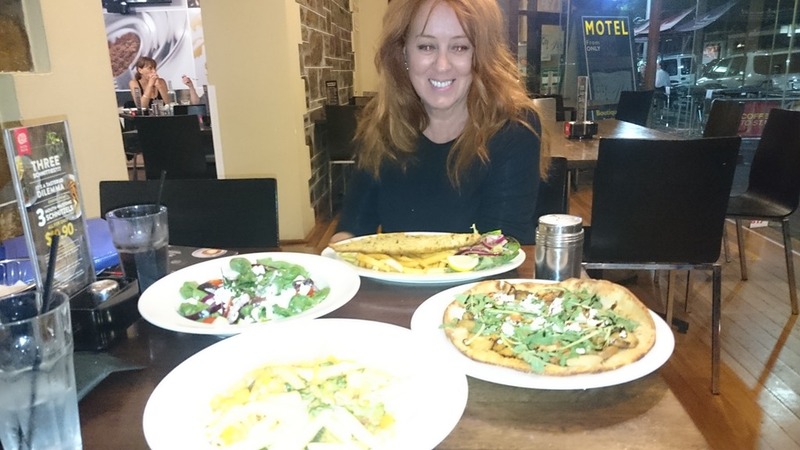 After a nice dinner with Bernadette, her husband and friend, we headed to Melbourne. Dave works in road safety and so we have a mutual friend. Small world. We arrived just before midnight and Nic and I stayed with his parents who kindly fed three very hungry cyclists. At 06:00 I headed to Melbourne airport and was home in N.Z. at 17:00. It was a great race and a great adventure. The challenges were there, the scenery was incredible, and the people along the way, amazing. I’ve never seen so many supporters of a race before (special thanks to Steve the policeman in Mt. Gambier who kept us safe by following with his flashing lights!). I’m grateful to have had the opportunity not only to participate in the race, but also to support Vasiliki as well. We were in 18th place when the race was cancelled. About 25% of the 70 starters had withdrawn from the race so we were doing quite well. A week later as I write this I am still trying to process all that happened but it will take a while… Suffice to say that Mike Hall will be greatly missed. 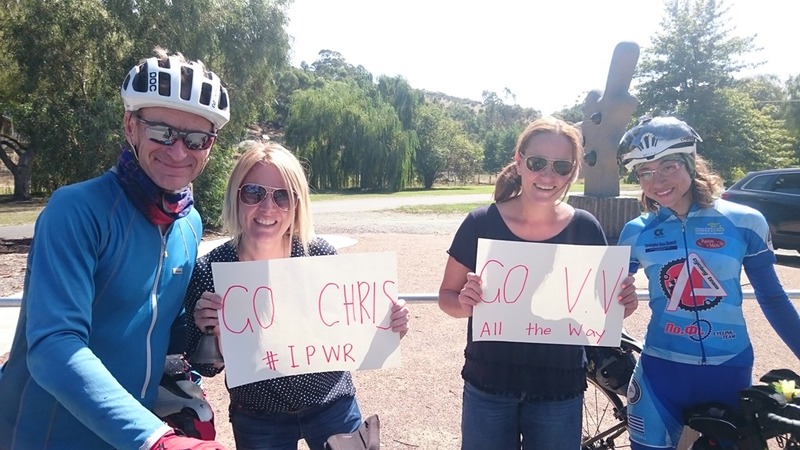 Incredible ride Chris, and much respect for sacrficing your race to help a fellow rider. I dropped my bike when taking a pee during the TA last year and busted the carbon bar, went through basically what you experienced. I now use an alloy bar. RIP Mike Hall. It wasn’t a sacrifice at all. Just changed my race goals! Interesting that you had a similar problem as I had not heard about it before. I’m leaving the alloy bars on. Not worth the risk to use carbon. What can I say. You did marvelously. I know it will take time to work through all what happened. Incredibly sad. I didn’t know Mike, but that didn’t stop me from being very teary when I heard about it. We are praying for you. We know it is hard, but we also know the stuff you’re made of. Love from the three of us. Really good write up of the adventure!